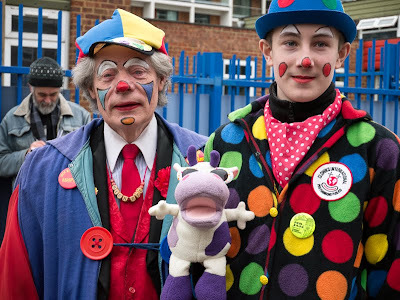 More clowns than you'd see at the circus gathered at a small church in East London last Sunday. The occasion was the annual service held to commemorate the life of the famous Joseph Grimaldi, regarded by many as the founder of modern day clowns. Known as Joey, his trademarks were the white painted face and harlequin suit, that are commonplace with clowns now. He would also joke about his name saying " I am grim all day- but I make you laugh at night". I would have loved to have been there. Great shot! I think I've heard about the "clown's church" before - but many years ago - the name Dalston seems to ring a bell. This is great! Many people are afraid of clowns. I really don't understand that.